This year’s Dino-n-a-Day was completed June 2, 2018. The Dinosaur created was a Megalosaurus (as was last year’s dinosaur) and they are going to replace the dinosaurs at the entrance into Granger by the Hisey Park, Main St. & HWY 223. 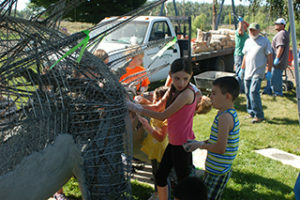 The dinosaur project was physically started around April 1994. In the early part of 1994, the Town’s Public Works Department was given the challenge of producing something along the lines of a dinosaur theme. The Public Works crew was in varying degrees responsible for the community float which had taken top honors all over the Northwest for three-four years prior, so this project was well suited for their abilities. The first dinosaur constructed was the baby brontosaurus. Public Works experimented with the construction process and has very much refined the steps in completing one of these creatures. 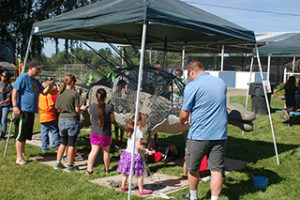 As of 2016, the City of Granger is home to 32 dinosaurs. Join us, the first Saturday of June, each year at Hisey “Dinosaur” park for Dino-n-a-Day, and help create the newest member of the Granger dinosaur family. This year the Dino-N-A-Day will be held on Saturday, June 2 at 9:00 am at Hisey Park. 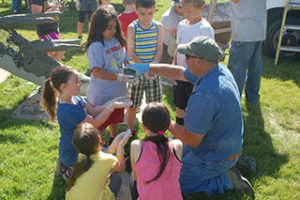 View the Granger DinoDrive Brochure for a fun activity in Granger.